It’s been a year and some change since Destiny launched last year. Destiny’s always been a strange beast, an FPS skimming the surface of MMO (Bungie prefers it be called a “shared-world FPS RPG”, if you want the official classification). It’s a game of ups and downs- the core gameplay is ridiculously solid and satisfying, the environments are well-designed and compelling, the loot is varied and interesting, and the underpinning lore is excellent, if derivative. On the flip side, all that lore is hidden and scattered, the plot feels is barebones and incomplete, and the endgame has a serious barrier to newcomers due to player progression being largely dependant on random loot drops. That said, with a group of committed friends, Destiny is one of the most rewardingly compelling experiences around, despite its myriad flaws, and a steady trickle of new content has kept me coming back every few months to face new challenges with my friends. Enter The Taken King, then, a major full-priced expansion. Overhauls abound, and the game spends some time walking you through these changes in your first couple of hours in the expansion. Where previously, character progression after level 20 was driven by “Light”, essentially the quality of your weapons, now you continue to earn experience points to reach level 40. The Light system is still around, but as far as I can tell it’s more of an indicator of the quality of your gear rather than a direct modifier on your player stats. In a nice touch, your level in TTK starts at whatever your light level was before the 2.0 patch, so you don’t skip a beat when you start up. A welcome addition is the exotic blueprint system, which means that when you acquire an exotic piece of gear, it’s yours forever, even if you dismantle it- you can trade some of your currency and resources to reacquire any items you regret losing, and certain items can be ascended to Year 2- level attack or defence scores once you’re at level 40. As previously mentioned, Destiny’s weak plot and characters were always a thorn in its side, and TTK has made an effort to beef itself up in this department. Much of the story is driven through missions issued by your Vanguard Class leaders, especially Cayde-6, who countless players will be surprised to realise is voiced by Nathan Fillion. Driven by Mr Fillion’s natural knack for roguish charm, Cayde-6 has shot from relative obscurity to engaging character, and all it needed was some screen focus. The other Class Vanguard Leaders as well as Erin Mourn and a small handful of other characters have been fleshed out a bit more, and it works to the game’s credit. Bungie never really focused that much on its characters enough, and hopefully this is evidence that they’re willing to develop their characters further, because a world without engaging characters is hard to care about saving. The story section of TTK is completable in around 5 hours, which is about half the length of the original story. 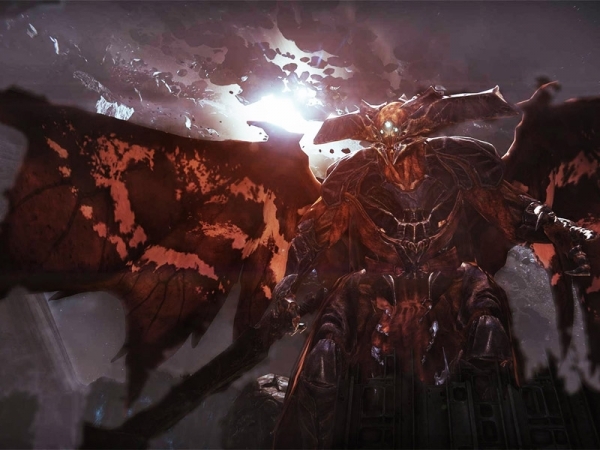 You’re facing down Oryx, the father of Crota, the Hive leader that you’ll remember being the final boss of the first expansion The Dark Below. Oryx is understandably miffed that you’ve killed his son, and has assembled a new faction, the Taken, by kidnapping and corrupting members of the other enemy factions. Story missions are more varied this time around, taking you around new and established locales as you face down the Taken, who are impressively different from their original enemy counterparts and allow for interesting combinations of Taken adversaries pooled from several different factions. TTK has brought a slew of new content, especially to players on Xbox, who are receiving the originally PS-exclusive weapons and strikes as well as the new area, strikes, missions, and raid (which is not available until Saturday, presumably to allow more people to reach the required level and gear quality). The way that you follow quests has been overhauled, which makes it a lot easier to keep track of the multitude of quests you’ll be following simultaneously. There’s certainly no lack of content awaiting you in TTK; I’m 10 hours into the expansion, and I have about 15 ongoing tracked quests. There is an issue with quest objectives not always being entirely clear, however I’ve had fun decoding my mission tasks and the new patrol area with my companions. Further increasing the variation on offer, each class has gained a new subclass- Warlocks gain arc-based abilities as Stormcallers, Titans wield hammers of solar light as Sunbreakers, and hunters gain the use of a void bow as Nightstalkers. As I’m playing a Warlock, I’ve been rocking the Stormcaller subclass to devastating effect- it’s a tremendously fun class to play; gliding about and blasting massive bursts of chain lightning through my foes feels incredibly powerful. I’ve seen the other new subclasses in action too; the Titan Sunbreaker class looks just as devastatingly potent, whereas the Nightstalker Hunter seems like a great support class. All in all, I’m very much enjoying my time with TTK. The plot is still lacking and I still have some issues with the loot system, but I can’t ignore the wealth of new content and small changes which add up to an impressively fresh overhaul of the game. I’m 10 or so hours in after 2 days, and the expansion still feels unscratched and fresh; I think that’s a pretty good feat on Bungie’s part. What’s The Best Way To Make A Daredevil Game?